I can’t believe it, I have an EP album! On October 16, 2016 I got together with six amazing musicians and recorded three of my songs. After three delightful months of mixing them with Gus and Ted at Low Tech Studios – here they are, right on my website. 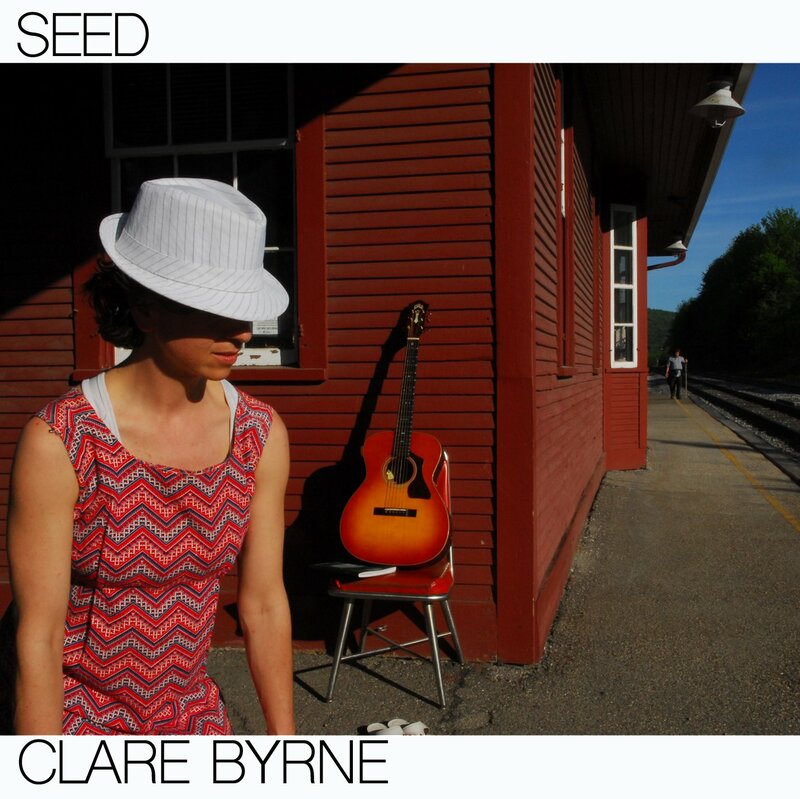 May I introduce: a petite EP album Seed. Really happy to get these seeds planted just before I leave the country for a while. And I really can’t express how grateful I am to the beautiful and talented people who have enfleshed, nurtured, watered, co-created, sparked, and made these songs come to life – Ted Looby of Burlington on electric and slide guitar; Dan Strauss of Brooklyn on piano and backing vocals; Remy de Laroque from Brooklyn/Paris on acoustic lead guitar, backing vocals and hand percussion (Dan and Remy are Ink the Octopus, an indie folk duo in Brooklyn); Bridget Wheeler, a Barre native, on upright bass and backing vocals; Chris Scroth, a new Brooklynite, on drum set, and Gus Ziesing on saxophone. 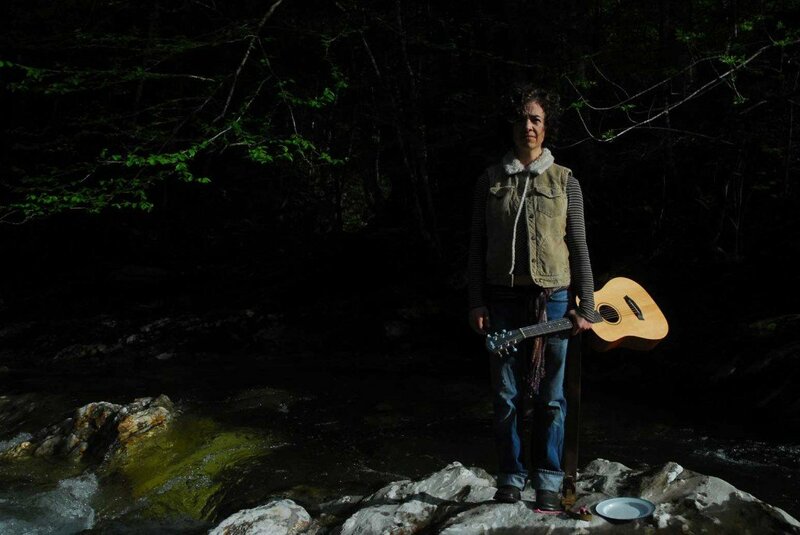 Remy also wrote and recorded beautiful lyrics en français for one of the songs, Child. So this is phase one – get these songs in and on the ground. But wait for it…. Spring is coming! Save May 27th 2017 – 8:00 – 10:00pm on your calendars – will be having a CD release event with Ink the Octopus at the Light Club Lamp Shop. Until then, hope you enjoy. In a new mode of creative working – musicking and moving – in one practice, one space. Here are tools of the trade – some old, some new, some borrowed and some blue. 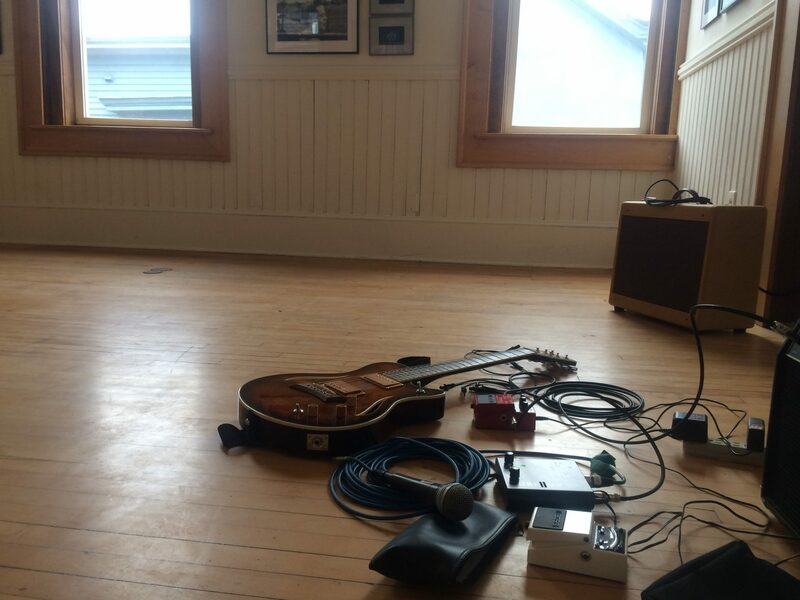 An old friend: a dance floor, a new hybrid guitar, various amps I’m borrowing/testing out, a loop pedal to create/practice by, the microphone, and in the blue bag, but a excerpt of the vast vault of writing/songs – in the form of notebooks and voice memo recorders. I’m going through journal/journey from the past five years – or more. I’m at New City Galerie on Church Street in downtown Burlington wrapping up a solitary January residency. It’s heaven. Two art gallery rooms to move and music in, poised lightly above Church Street on these wintry days and evenings when the whole town feels like it’s resting, humming. 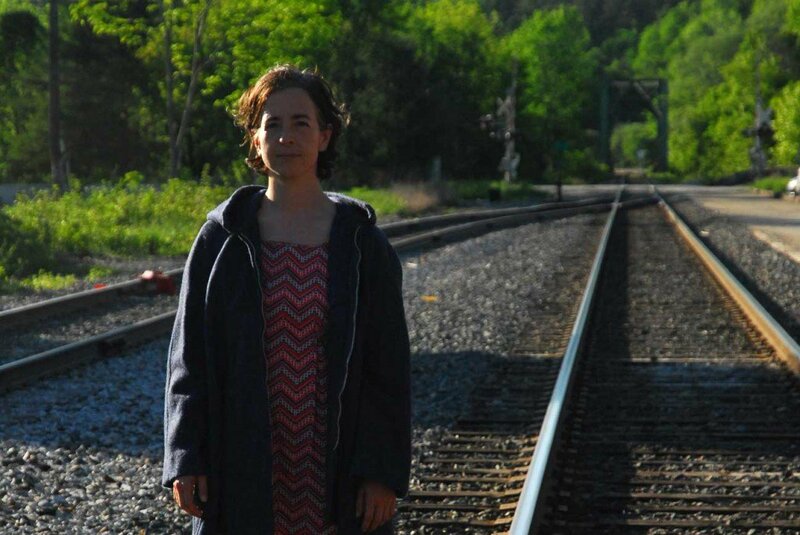 The gallery itself is humming with a beautiful exhibit of photos – “Eyes/Vermont” – only there for another few days. My eyes and ears pore over it as I embark on my own work. It is a wonderful way to take in art; the creative mind and body is a most absorptive gallery-goer. Why don’t we make galleries and museums into spaces to both make – and take in – art? As with all work spaces, I fall in love – enjoying the light and dark moods of the space, the wooden floors and walls and the large windows that frame their own living art – roofs, trees, birds, sky, and the illuminated clock of City Hall. 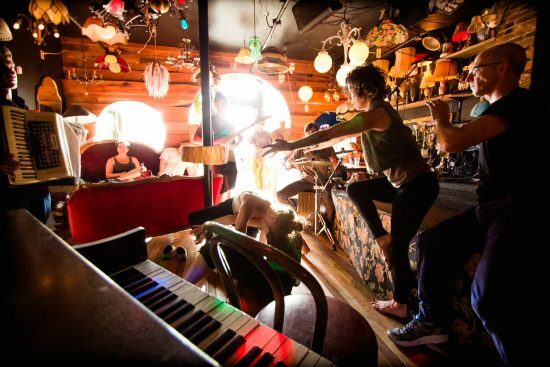 Wish I could be there forever – making dances, looping guitar riffs, ruminating on Joseph Pensak‘s beautiful piano and amps, singing, and gazing out at sparkling city scenes. But content just to have contributed a bit of my own hum. Beautiful to spend time at The Dragon’s Egg developing first inklings of a new dance work, with the working title “chthonic.” It was a cold few days outside; we gazed out on the starkly barren Connecticut fields and forest lands – but in the Egg, all was warm, full of life, full of creativity. Lovely to work with a newly assembled group of Vermont dancers – Avi Waring, Marc Wennberg, and Bridget Wheeler – as well as Vermont musician and composer Randal Pierce, who was composing on the spot as we tried out movement material. So grateful to be in the space with its march of light and shadow – its levity, depth, color, joy and silence – in the swing of light and dark – at this time of year. And to work out some primal energies! Chthonic-ly, we ran, rolled, rumbled and resounded. So helpful to show some material to a small wonderfully receptive audience on the last night, get great feedback – and then end with a truly stupendous feast at Marya Ursin’s and Dan Potter’s house in Stonington. Thank you, Marya and Dan. A last tag-note: please send healing and restorative energy to Dan, who just lost his work studio in a fire on Dec 27th. Thinking of you and sending love, Dan! 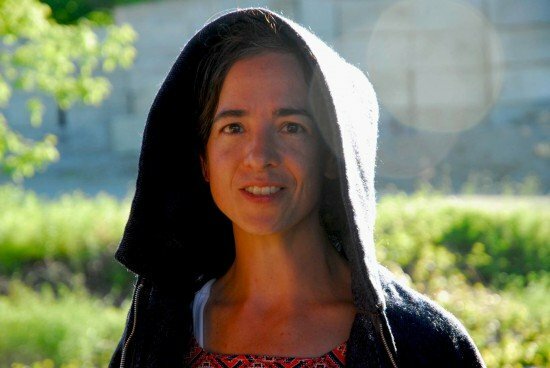 Moving from the frenetic pace of the heart of the fall semester into the very beginnings of slowing down – for snow, winter, for artistic reflection and renewal time. A sabbatical beckons in the spring – my first ever! Back in October, the first intimations of winter and precipitation moved strongly enough through the season to force Persephone Cryptogamae, the UVM student site work, inside to Mann Gymnasium on the Trinity Campus. And in and around that event – lots of delicious dance and music doings: I played my songs for the Sweet Sixteen birthday anniversary at Radio Bean; facilitated a flashmob choreographed by my UVM composition class at the UVM airport, and chaperoned them to the third Vermont College Dance Festival at Bennington College; recorded overdubs and started mixing in my three-song “albumette” recording project; hosted two live music and dance improvisational Mixers at the Light Club Lamp Shop; hosted Eat My Art Out – my tri-annual work-in-progress showing event – at New City Galerie in Burlington, with wonderful artists Christine Holt, Lydia Kern, Ula Klein, Mia Pinheiro, Hanna Satterlee, Marly Spieser-Schneider, Denise Townsend, Avi Waring. I visited my family in North Carolina for Thanksgiving. I am looking forward to the end of the semester – student showings and creative offerings aplenty! – and then a retreat – with a new group of musicians and dancers – to the Dragon’s Egg just before the holidays commence, in a first round of investigation into a brand new dance collaboration with composer Randal Pierce. 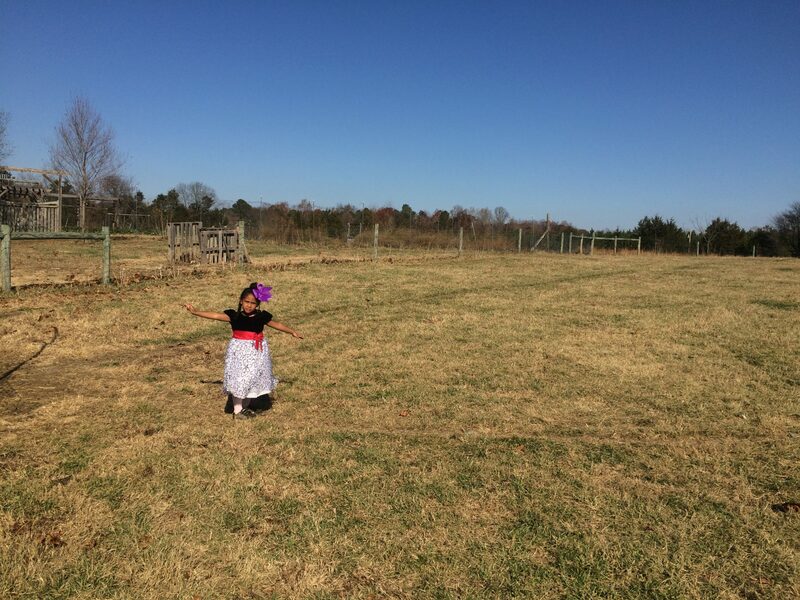 This photo I call “Laxmi’s World” – my beautiful goddaughter Laxmi Sade, queen of her world on the family farm in Bear Creek, North Carolina. 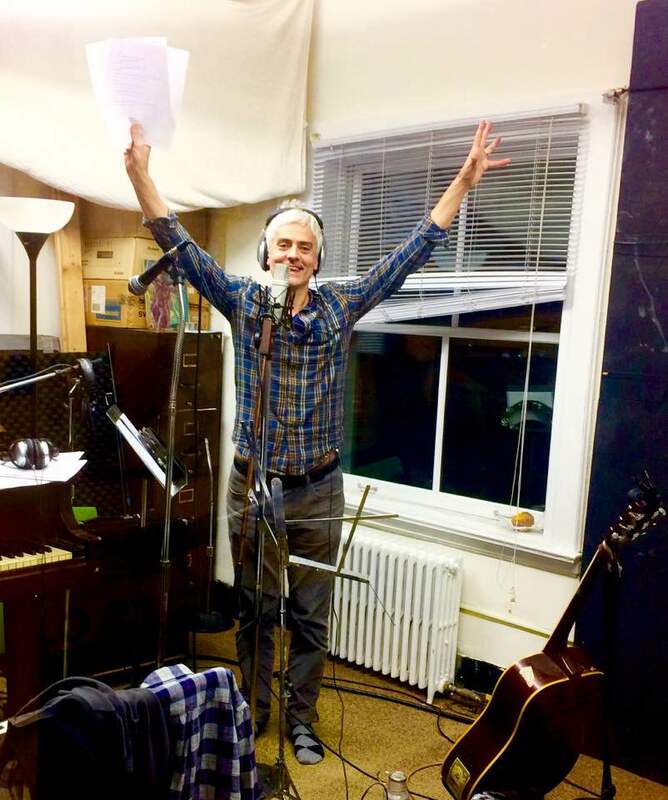 Astounding how fun being in the recording studio is, for hours and hours…as Dan Strauss said – “Studio time is the best time.” Here is Remy de Laroque about 10 hours in, giving the victory sign. Loved working with all these amazing people and doing it at Low Tech Studios in Burlington. Three songs are awaiting the mixing process with Ted, Gus and myself. 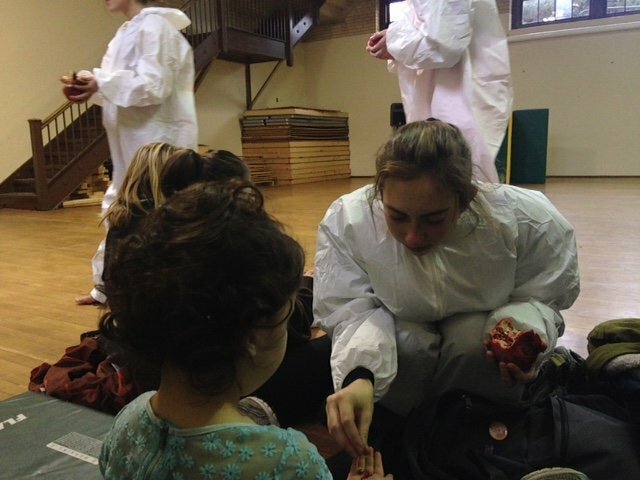 The UVM Site dance, Persephone Cryptogamae went up this weekend! As the week went on – all this cold wet wintry weather – we realized we’d need to move it indoors, but Mann Gym hosted the dance beautifully: a focused intense spacious container. Here is Molly Kaye offering pomegranate communion to a young audience member. 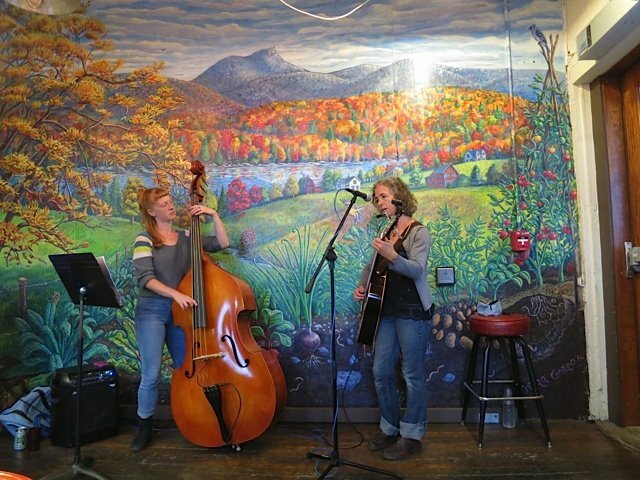 Bridget Wheeler and I just played our first gig at Pingala a week ago – here we are in a photo by Cristiana Mazzoni, with that stunning fall backdrop at Pingala – exactly how it really looks here in Vermont right now. Excited to head into the recording studio this weekend with Dan Strauss, Ted Looby, Remy De Laroque, Chris Scroth, Bridget Wheeler to record some of my songs. 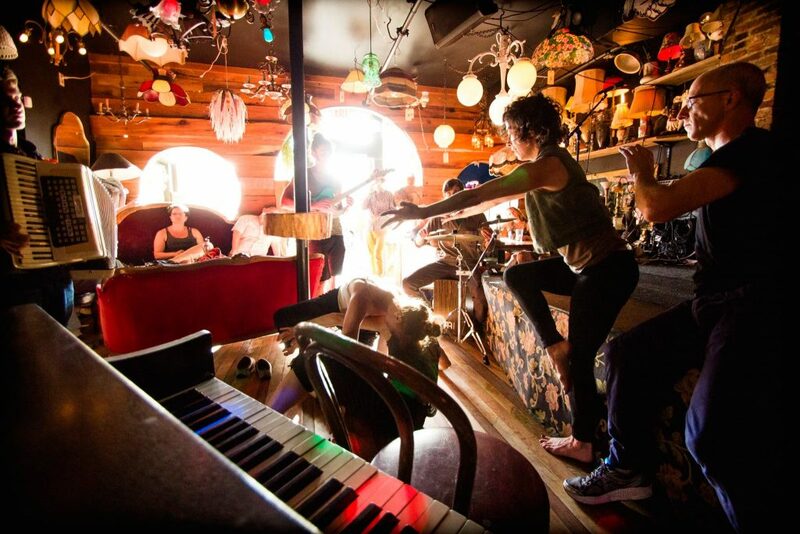 Dan and Remy will play some tunes at the Light Club Lamp Shop on Saturday at 8:00 – please come by! I’m still in wonder about Erika Senft Miller’s “Between Land and Water” event on September 10th. 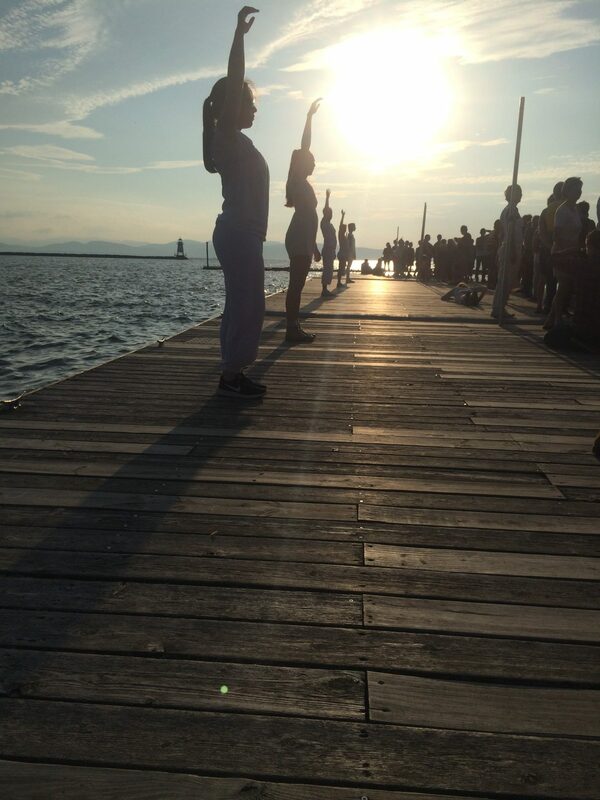 This photo shows my UVM Comp class performing on the dock of the Burlington Community Sailing Center as part of this event. 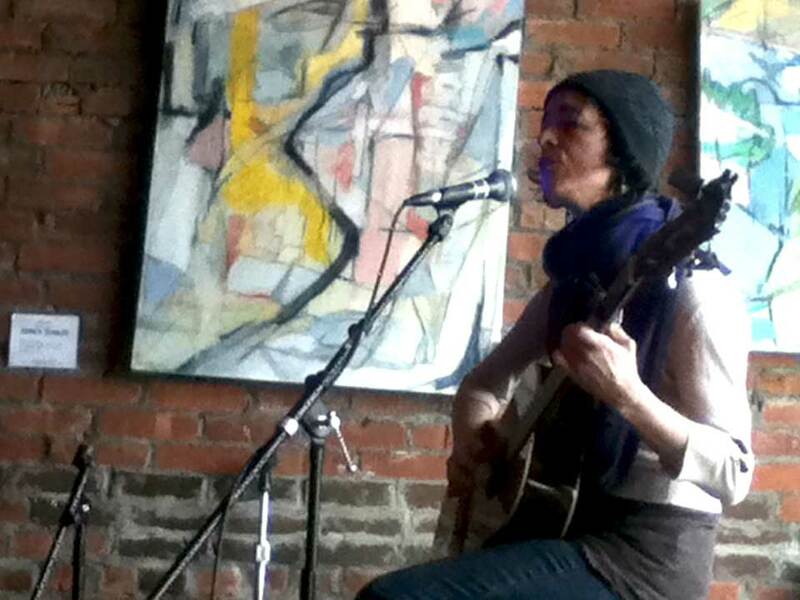 Friday Sept 30 I will be back at the Light Club Lamp Shop in Burlington performing the monthly “Mixer,” at cocktail hour, 6:00pm – this may end up being a solo show… or a solo-on-solo show. Either way, I’ll be there, moving! 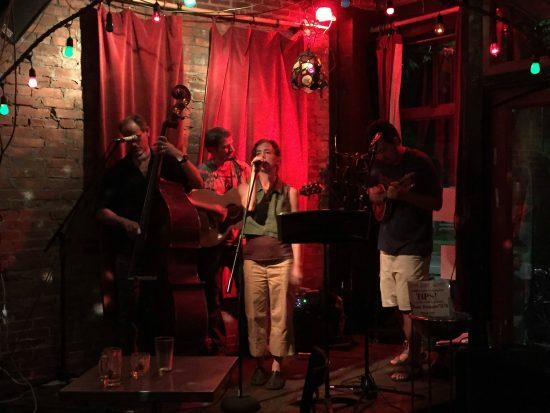 Then Saturday night Oct 1, I will be performing my songs on guitar and harmonica for the first time at Pingala Cafe at the Chace Mill, and for the first time with Bridget Wheeler on upright bass – a wonderful dancer and musician. 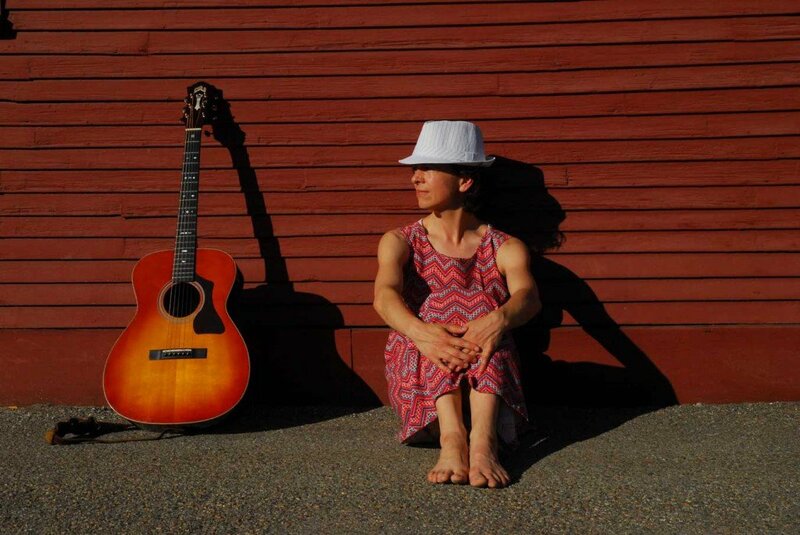 Have really enjoyed beginning a musical collaboration with her – so looking forward to beginning to perform together. Last, on Sunday Oct 2 – the first of the student choreography workshops at UVM’s Recital Hall. We are doing a daylight showing, to leave light and room for outside site choices for dances. 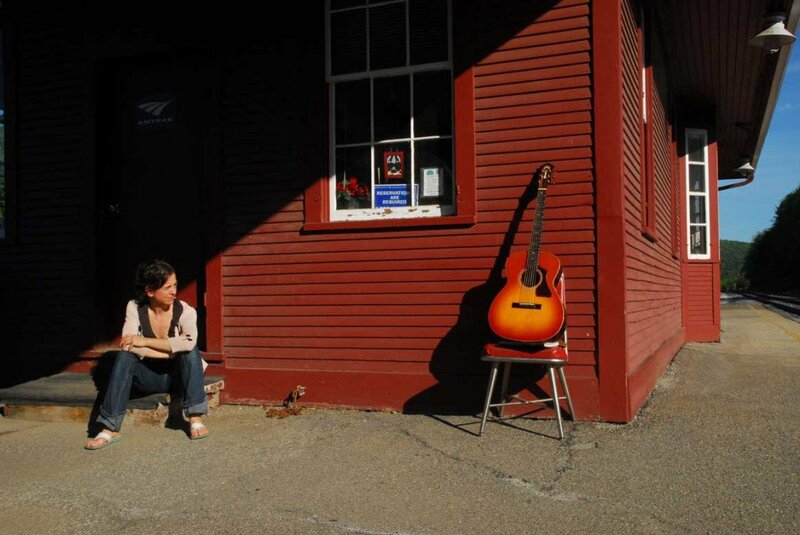 A little into the future: I can’t believe I go into Gus Ziesing’s Low Tech recording studio in three weeks, to record three songs with Bridget Wheeler, Ted Looby, Remy de Baroque, Dan Strauss, and Chris Scroth. A fantastic band, we may just have to up and take it on the road. I feel lucky! The amazing Peter Cunningham took this photo of me as Chaos. 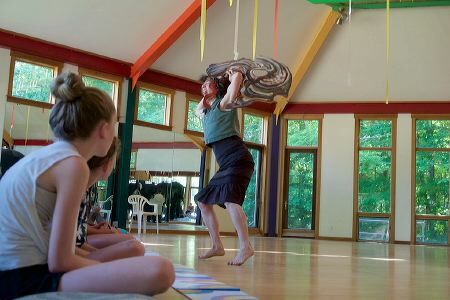 I head south to Connecticut tomorrow, for my yearly disappear into the perfect “o” of summer – The Dragon’s Egg Summer Solstice event. 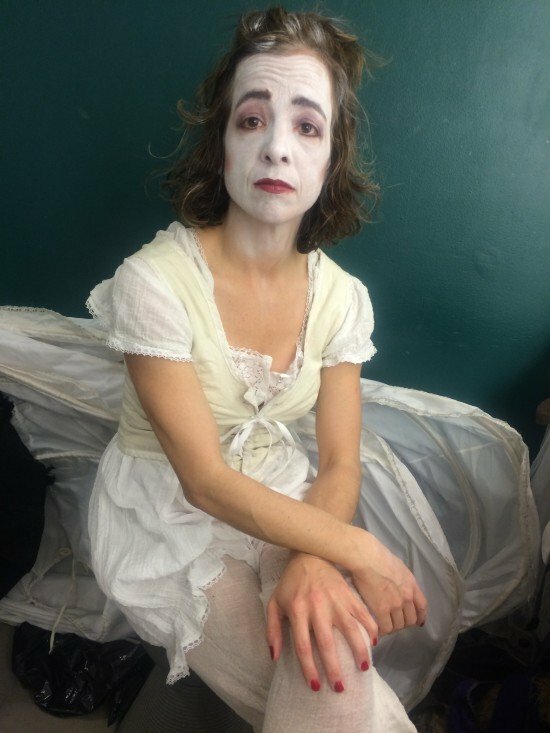 This is a yearly narrative-based project; this year we look through the lens of Ovid’s Metamorphosis. 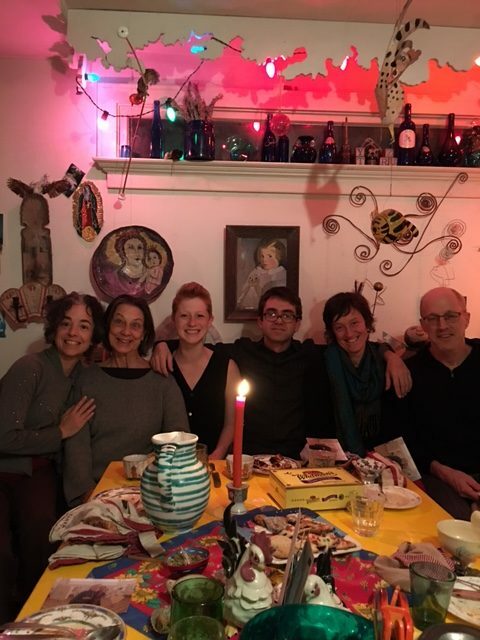 I always feel so lucky and grateful for this event – and to be friends with Marya Ursin and Daniel Potter – who loft such special celebrations of life and art, replete with overflowing food at cast dinners, music jams, in their very special studio and home. I weeded my fallow garden this week. 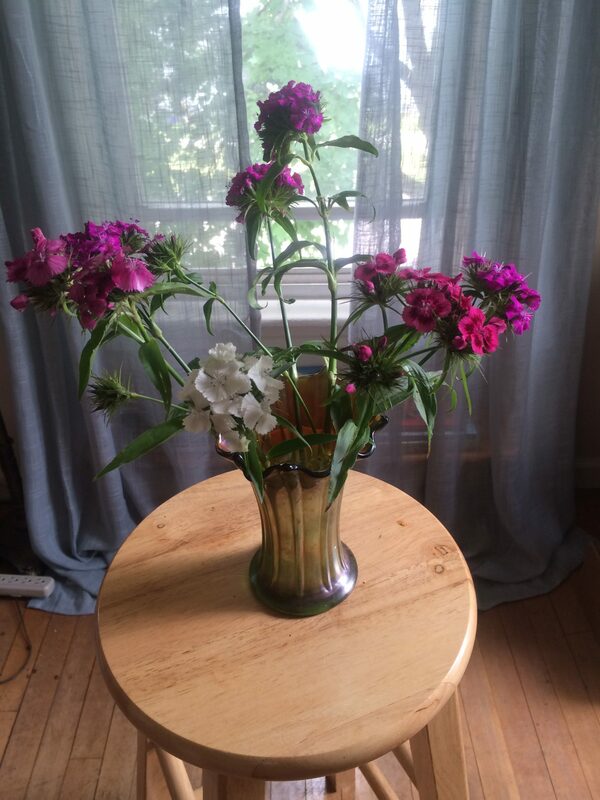 I will plant cover crop soon – oats, which dries to a beautiful docile hay-like cover for the beds – but in the meantime, I am enjoying the “volunteers,” as my dad says – cilantro in my meals, and these Sweet William in a Carnival vase that comes from my paternal grandmother, Edna Reinhardt Byrne.